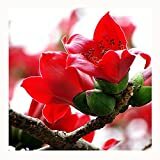 Bombax ceiba growing tree of the genus Bombax also known as Red silk cotton tree, Bombax ceiba perennial deciduous used as ornamental drought tolerant plant, shade tree or bonsai, can grow in subtropics, mediterranean or tropics climate and growing in hardiness zone 10+. Leaves color green in elliptic shape the leaves connected in the base in hand shape 5-7 leaves. Flower color red to orange waxy with five petals the base is round.